You’ve probably heard that the vast majority of species are unknown. Scientists estimate that there are around 9 million eukaryotic (i.e. not bacteria) species on Earth, but we’re only familiar with about 20% of the world’s biodiversity. It’s thought that most of the undiscovered creatures are small, easily-overlooked creatures like insects and other invertebrates. You’d think that larger, more obvious animals would’ve all been found and described by now, right? Given that the saola was only discovered in 1992, maybe not. A captive female saola in Laos, 1996. Image by William Robichaud, via Global Wildlife Conservation on Flickr. “What the heck is a saola?” you ask. The saola is a large forest-dwelling bovine that lives only in the Annamite Moutains in Laos and Vietnam, and it’s critically endangered. They’re related to antelopes and buffalo, but they fall into their own genus – Pseudoryx, for their resemblance to the oryx, a type of antelope found in northern Africa and Arabia. The name saola comes from local words meaning “spindle,” for the shape of their horns. A saola’s skull was acquired from a hunter in Vu Quang National Park in Vietnam in 1992, and scientists studied them in captivity when possible, although they never survived more than a few weeks. Almost all other information about saola behavior and habitats (about which there is very little, even today) comes from villagers in the Annamite mountains. 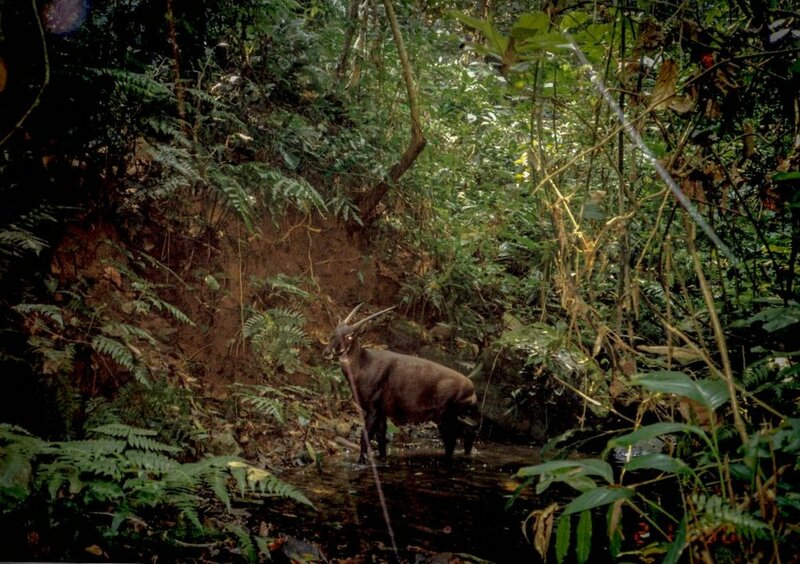 The first photo of a wild saola ever, captured by a camera trap. Image from William Raubichaud, via the Saola Working Group. Saola are around the same size as larger Shetland ponies, and are mostly brown with white patches on the face and a black stripe down the back. Both males and females have the spindle-shaped horns, which can reach 50 cm (20 in) in length. They’re generally gentle forest browsers, and they keep away from human settlements. A camera trap finally captured a photo of a wild saola in 1999, but even now, a wild saola has never been seen by a scientist. Some have likened it to a unicorn, based on its elusiveness, gentle nature, and spectacular horns. No word yet on whether or not it only tolerates the presence of young maidens. Nguyen Huu Hoa shows some of the snares collected during a routine patrol in the Annamite Mountains. Image by William Robichaud, via the Saola Working Group. 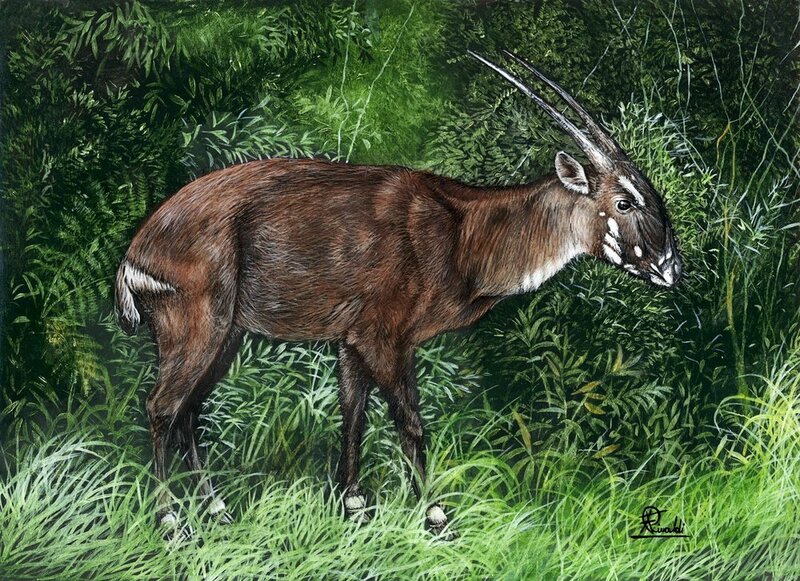 Because the saola was discovered so recently, we have no idea how many there might have been in the past. Now, however, population estimates range from 30-300 individuals in the wild, potentially making it the world’s rarest land mammal. Many species in Vietnam and Laos were decimated during the Vietnam War, especially by Agent Orange, which killed a lot of the foliage that makes up the saola’s diet. Additionally, the Indochina region is one of the most popular areas for hunting and trapping animals used Chinese Traditional Medicine (including the pangolin). While the saola is not one of the many animals thought to have curative powers (spoiler alert: none of them do), they often get caught in snares meant for other creatures. William Robichaud, the world’s leading authority on saola, has compared the situation to dolphins being caught and killed as bycatch in industrial fishing operations. Conservation workers have removed over 130,000 snares from the Annamite Mountains since 2011, but thousands more remain. There is some hope for the saola though. Locals have been made aware of the rarity of the saola, and they are taking action to protect their “unicorn” – especially because it costs them very little, and there have been no conflicts with saola (they don’t eat people’s crops, for example). They are not used in traditional medicine, valued as an exotic dish, or prized as a hunting trophy. The governments of Laos and Vietnam have a close working relationship, which makes state-sponsored conservation efforts much easier. And people are starting to spread the word. Illustration of a saola by wildlife illustrator Francesco Rinaldi. The story of the saola (as short as it is) really illustrates why habitat conservation is so important. We have no idea what undiscovered species might live in any given ecosystem, from the rainforests of Central Africa to the ice sheets of Antarctica – or even in that little creek in your neighborhood. Just because we don’t know about them yet doesn’t mean that those animals, plants, fungi, or whatever aren’t important. Every piece of the puzzle matters - even if you can’t see the entire picture yet. You can support saola conservation through the Saola Working Group, or through the World Wildlife Fund or the IUCN.